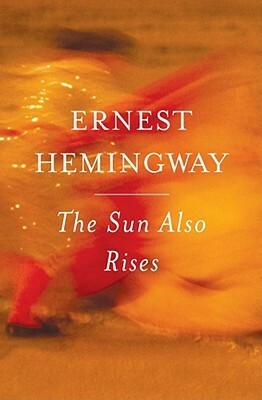 Recently I read The Sun Also Rises by Ernest Hemingway for the second time; predictably, my love-hate relationship with this classic American writer continues. I first read this classic American novel in April 2015, almost exactly one year before I reread it again in April 2016. I had read Hemingway’s A Farewell to Arms for English class during my junior year of high school and didn’t really enjoy it, so this was my way of giving Hemingway another chance. As you can tell by my first review, his writing still didn’t click with me. Spain. Bull-fighting. A lot of drinking. Parties. Choppy, terse writing. The Lost Generation. My memories of this novel were a blur of these various elements, accompanied by my negative impressions of it. I tried to go into this reread with an open mind and push those past judgments away, but it was difficult to do completely. The Sun Also Rises was assigned reading for my Cultural Diversity in American Literature class this past semester. At first I was disappointed (I would have to suffer through it again?!) but over time I actually looked forward to giving it a second chance.Because I read it on my own the first time around, I suspected that there was a lot I had missed. I hoped that class discussions and my professor’s enthusiasm would rub off on me and transform me into a devoted Hemingway fan– or, at the very least, help me appreciate his writing a bit more. I’m just not destined to love this book. Overall, I certainly enjoyed it more than I did when I first read it; however, there’s just something about this novel that I simply can’t click with. One positive outcome of rereading The Sun Also Rises is that I’ve gained a greater appreciation for Hemingway’s writing. My professor described his choppy, short, minimalist writing style as an iceberg: there’s so much more beneath the surface than will ever show on the page. In other words, what he doesn’t say is more important that what he does. 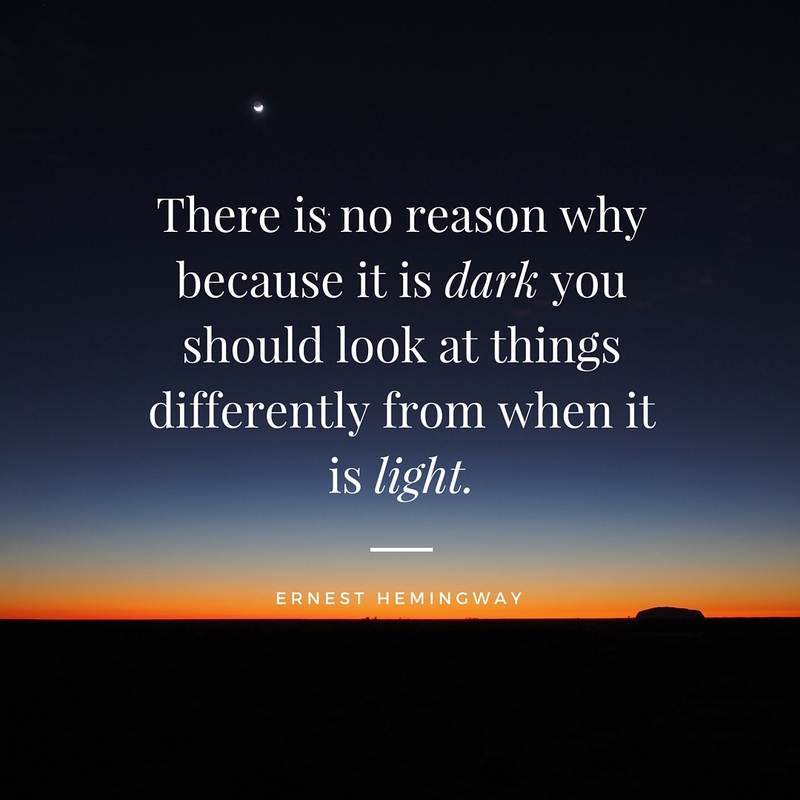 His explanation shifted the way I read Hemingway’s work, allowing me to look past the narrative itself to the core of what he was trying to get across. One of the more obvious examples of this is Jake’s injury, for Hemingway never directly identifies his wound by name. If you don’t pick up on what his war injury actually is, then chances are that you’re missing a lot of the tension between Jake and Brett. In this way, the story is also more complex than I initially thought. Most of the characters in this novel are quite unpleasant, but that doesn’t mean they’re not interesting to read about. Brett fascinated me the most, for she straddled both the masculine and feminine spheres of society. She calls people “chaps” as though she is one of the men, yet she is also produced as “sexually promiscuous,” a trait that is stereotypically feminine. It’s almost as though she is an androgynous character, neither male nor female but seemingly both at the same time. This portrayal of a woman is another example of how Hemingway conveys a lot by actually saying very little. Despite my newfound appreciation for the fascinating and complex nuances of The Sun Also Rises, I just never became invested in the story. For me, this is one of those books I enjoy thinking about rather than actually reading, if that makes sense. I admire the challenge it poses to me as a reader, but I would never pick this novel up for purely pleasurable, entertaining purposes. Hmmm… Probably not, unless I have to read it for another class or have a friend who is willing to read it with me. I might try picking up some of Hemingway’s other work, but I think The Sun Also Rises and I may have seen the last of each other. While I’m still not completely sold on Hemingway’s writing, I must admit that I did enjoy this novel more the second time around. 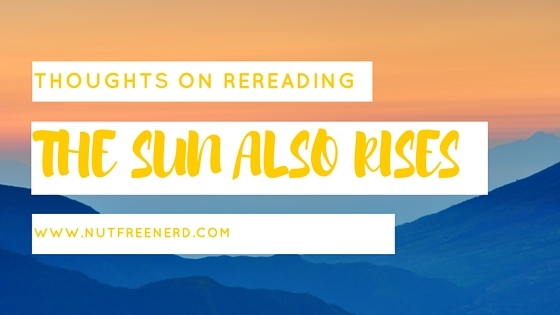 What are your thoughts on The Sun Also Rises? Do you enjoy rereading books? Would you recommend any of Hemingway’s other works? Let me know in the comments section below! That’s how I’m trying to think about it too– at least I liked it more than last time! That’s a really good point about the ironic relationship of Jake and Brett (the impotent vs. sexually active contrast). These are the kinds of things that I really appreciate and admire about the way Hemingway crafts his stories, but I just can’t seem to click with his choppy, disjointed writing style. I want to enjoy his works so very much, but it seems like at least for now his writing style is just not for me! I am currently reading Great Expectations, and to be honest, I did not have many great expectations on beginning the book (har har); but from my current progress of about 3/4 finished, I really, really like it. I really love anything by F. Scott Fitzgerald– This Side of Paradise is my favorite. Yes, Jane Austen–Pride & Prejudice–and I keep meaning to read more of her works. Catch-22 was something I enjoyed also. Hmmm, I’ve never tried My Antonia and As I Lay Dying, I’ll just put those on the list 😊. The only Hemingway I’ve read have been short stories, and I feel his style works well within them because of their snapshot nature. I would recommend The Short Happy Life of Francis Macomber. It’s a lot clearer than Hemingway normally is and I personally found it a good engaging read (especially character-wise, but I’m usually intrigued by his characters). Which writer would you recommend to me? That’s a really good point– maybe I’ll try out some of Hemingway’s short stories and see if his writing style clicks with me more then. Thanks for the recommendation! 🙂 I would recommend works by William Faulkner, specifically As I Lay Dying. I recently finished reading it and was absolutely blown away! I’m also currently reading his novel called Light in August, and it’s fantastic as well. Hope this helps! I’ve always wanted to give Ernest Hemingway a shot (i’m so in love with his quotes that are posted all over Tumblr, We Heart It and Pinterest) i just never have any time to pick up one of his classics. You do make me want to change that though! You should definitely give Hemingway a shot! I know a lot of people who love his work, even though I’m not really one of them (unfortunately!). If you do try him out, The Sun Also Rises might be a good place to start. Yeah…all my teachers seem to love Hemmingway, and I couldn’t understand why; then I read Flannery O’Conner’s dreadful (and wonderful) southern gothic stories and I finally understood how terrible people and events could still make a great story. I still don’t like to subject myself to these kinds of stories, but I can handle it if I must. So, er…yay, empowerment? Haha. I’ve never read anything by Flannery O’Conner, but I’ve heard fantastic things about her work. I’ll definitely have to give it a go at some point! I’m so glad my post could help! 🙂 Hopefully you enjoy Hemingway’s work more this time around! I went through a Hemingway kick a few years ago because I hated, absolutely HATE The Old Man and the Sea when it was assigned for high school English. Years later, I had The Sun Also Rises for a class in American Lit while doing my M.A. and really enjoyed it. Of Hemingway’s novels, this is interesting to me most for his creative beginning when you think it’s going to be a story about a Jewish Boxer coming to Paris and then BAM, nope… gotcha! A reread of The Old Man and the Sea while I had a bit more life under my belt and could feel that cold sting of mortality helped me to understand this story so much more. Sad and true and heartbreaking… you could see why he won the Nobel with this. However, perhaps the most interesting work of Hemingway’s is The Garden of Eden, something published posthumously and often an afterthought. Here, the character of Brett is basically reincarnated and able to delve even more into this dual identity or dual role of masculine/feminine. Last note: For those still working on their craft of writing (which is pretty much every writer, I think) I try to talk up the “Hemingway Library Edition” of A Farewell to Arms. This edition has includes an appendix with the 40 or so of the known endings that Hemingway went through before arriving at THE ending. It’s really wonderful to follow a master writer’s creative process. The Garden of Eden actually sounds really interesting, so I just might have to give that one a try. Brett is a fascinating character in The Sun Also Rises, especially from a gender identity perspective. Thanks for the recommendation about the “Hemingway Library Edition” of A Farewell to Arms. I read the regular version of that novel as a junior in high school and enjoyed it enough, but I’d be really interested to read all of the different endings! I’m always curious about that sort of stuff, particularly when it comes to classic writers. Me too! As a struggling writer, I find it instructive and somehow heartwarming to see the struggles of the greats.